Learning to be a father takes time and experience. Fathers should take all the opportunities possible to bond with their child. 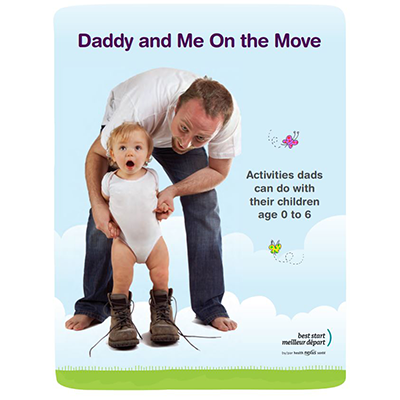 This booklet is about making the father-child relationship the best it can be. Sharing activities is a great way to build the important bond with a child. Doing things together provides closeness, builds trust, creates memories, and teaches skills that last a lifetime. In short, sharing quality time gives a child a sense of belonging. An involved dad has a powerful and positive influence on the development and health of his child. Give fathers ideas of things they can do with their young children, beginning with the important bond that starts during pregnancy. Provide information on how activities are important for them and their child. Explain how doing activities with their child can strengthen their relationship. Highlight cues they can watch for in their child so they know what activities to suggest. Though many dads love rough and tumble kinds of play, there are many different ways to be active with children. All the activities in this booklet are meant to be fun and done easily, whether in a busy city or a quiet town.